A new social media trend has upset many Americans, and it’s easy to see why. 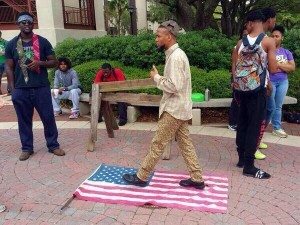 A Georgia college student and purported Black Panther member, Eric Sheppard, entreated social media users to stomp on and desecrate the American flag, then post their pictures and videos with the hash tag: #TheEricSheppardChallenge. One U.S. Marine veteran, Shane Lawler, recently spoke out about the “challenge.” In the video above, he relayed his views of those who seek to debase, or dishonor, the U.S. flag he defended. A warrant for Eric Sheppard’s arrest was recently issued on suspicion of a concealed weapon.